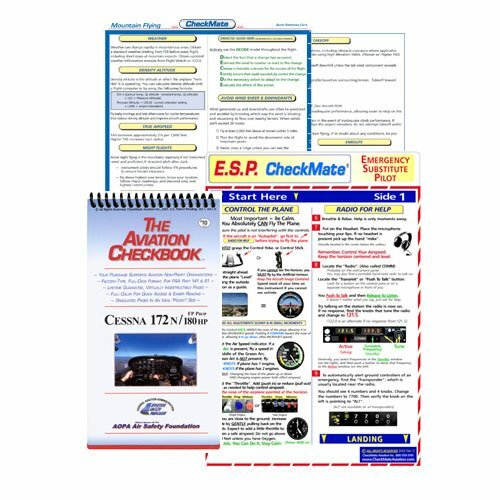 CheckMate Aircraft Checklists and Checkmate Aviation's CheckBook have all the steps needed to fly the airplane. Both also include emergency procedures and other misc. data. CheckMate Aviation Checklists are printed on a single plastic card, thus no flipping for data.The text is slightly smaller. CheckMate does not use a "response system", (a carry-over from 2 pilot operations, and is not needed for the experienced pilot.) CheckMate checklists are more concise, in phraseology, in order to to get everything on one card. The Aviation CheckBook , on the other hand, does use a "response/explanation" system which might be useful to new pilots. At times, it does go into further explanation of an item. A good example would be Mags. CheckMate will say L&R. CheckBook goes further and indicates "+ or - 50 RPM". CheckBook, keeps you focused on just the one aspect of flight you are in, but you have to flip pages to go to the next phase. It really boils down to if you want everything on one card, or a flip book that fits in your pocket.